I’ve been a bit down since I returned from Italy, and frankly (just ask my husband), kind of cranky. I have that problem coming back after a few weeks in Italy, and I’ve even written a blog post about adjusting to the “real world” after a vacation. And yet here I found myself this weekend, alone with the dogs while my husband was out golfing, in a funk. I knew what I needed to do: time to recreate one of the dishes from the cooking school where I spend a week every May with guests. 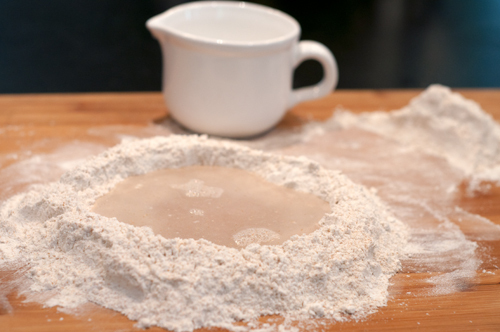 One of the things we do while at the cooking school is make homemade pasta every day. I didn’t have any of the right ingredients on hand (very finely ground semolina and barley flour), but forged ahead anyway, creating the pasta dough from half all-purpose flour and half whole wheat flour. 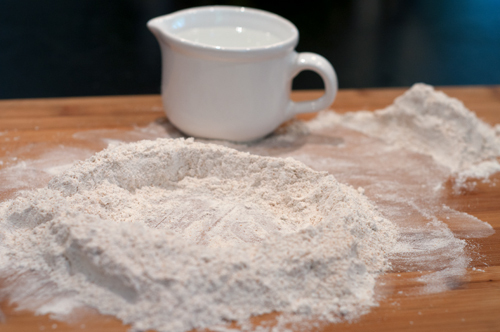 When making pasta by hand, remember it’s always easier to add in more flour if the dough is too sticky than it is to add water into crumbling dough. 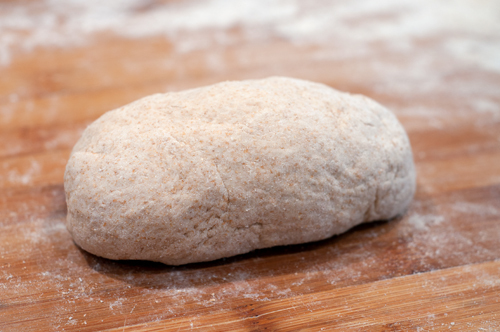 When it comes together like this it’s time to start kneading, incorporating in more flour until the dough is no longer sticky. 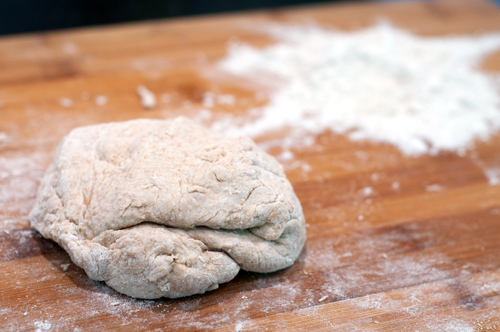 After you’ve added the last bit of flour, knead it a couple more minutes until it’s nice and smooth. 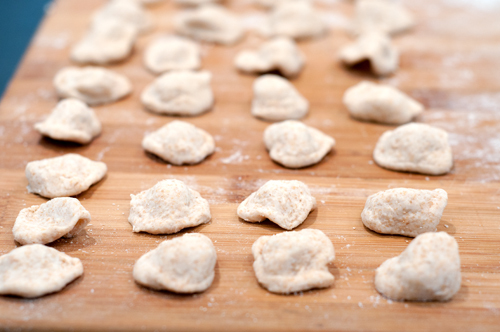 I won’t even attempt to take you through the technique of making orecchiette – it’s the most complicated of the shapes we make at the school, learning our way from the easier types first. Come with me to the school one of these years and you’ll become an expert at all the shapes. (Next trip: May, 2014) My friend Silvestro, who runs The Awaiting Table Cookery School in Puglia, says the reason Italian food is so delicious is quite simple: take spectacular ingredients and try not to mess them up. That means starting with a couple of tasty things – in this case my homemade pancetta and some organic green cabbage – cook them simply, and enjoy. 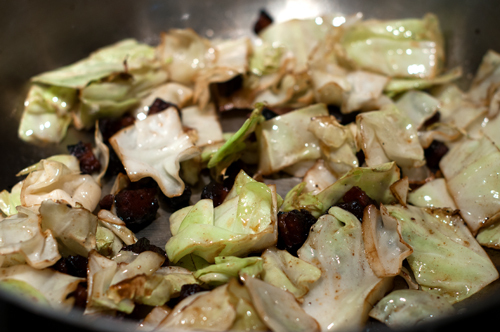 The pancetta is cooked first and some of the fat drained off before sautéing the cabbage with it. After the pasta is cooked, it’s added to the pan and a simple pan sauce is made using some high quality olive oil and a bit of the pasta cooking water, along with some Parmigiano Reggiano cheese. 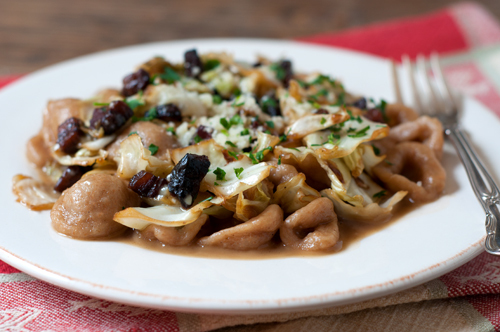 I’m still missing Italy, but I felt better as soon as I savored the first bite of this classic pasta dish from Puglia. Won’t you come with me next time?